THE BLEACHER BRIEFINGS: Thanks For the Memories, Chipper! Last Friday truly marked the end of an era in Atlanta. Chipper Jones, who spent nearly two decades in Major League Baseball (all with the Braves), closed the book on his stellar career in a 6-3 loss to the St. Louis Cardinals. Jones began his baseball odyssey as a pitcher and shortstop at Bolles School in Jacksonville, Florida. His superb hitting and pitching helped lead the team to two state championship games, winning one. In 1990, he got his major league break when he was drafted in the first round by the Braves. He proceeded to make a successful rise through their minor league system and changed positions to third base. At 21-years-old, he was called up to the majors and debuted on September 11th, 1993. Despite being plagued by injuries throughout his career, Jones still managed to achieve greatness. In 1995, just 2 years after his debut and only 1 year after a season-ending ACL tear, he won a World Series ring. From 1999-2008, he won the NL MVP, the Silver Slugger Award (twice), and a batting title. He also became the Braves all-time hit and RBI leader, and played in 8 All-Star games. In 2010, Jones got off to a lackluster start and later tore his ACL once again. While retirement was considered, he didn't want his final image to be that of an injured man sitting on the bench. He was determined to recover. Chipper came back with a vengeance in 2011. He got his 2,500th career hit and 450th career home run, all while playing on a torn meniscus. But every great story must come to an end. Jones announced that he would retire following the 2012 season -- but he went out with a bang. He had a very productive year, and even made the 2012 All-Star Game, where he told his teammates, "I'm not gonna lose my last one." And he didn't. The National League won 8-0. Jones ended his career with a .303 average, 2,726 hits, 1,623 RBIs, and 468 homers. With numbers like that, there's no denying that he is one of the greatest switch-hitters in MLB history. 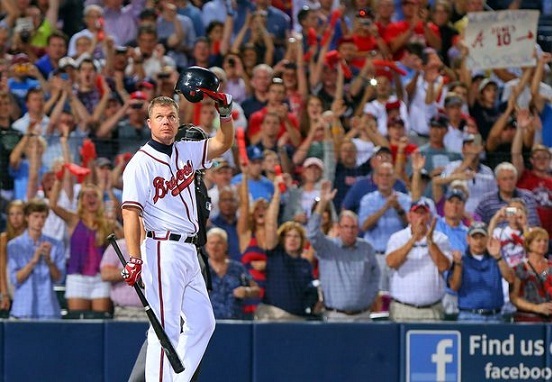 So from baseball fans everywhere: Thank you, Chipper. The game already seems a little dimmer without you in it.